Spiritual Formation - How Widespread Has It Become? See also our research on Spiritual Formation. This is a list of ministries that are now promoting Spiritual Formation. See our list of Christian colleges and universities that promote Spiritual Formation. Also see our list of Christian publishers that are promoting Spiritual Formation. 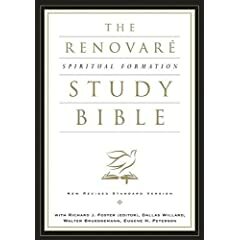 Richard Foster's new Renovare Spiritual Formation Study Bible has now been released. Editors for the "Bible" include contemplative supporter Walter Brueggemann (who endorses a book, Reimagining Christianity that says the doctrine of the Cross is a vile doctrine),Eugene Peterson, and other contemplatives. Are these practices Scriptural? If not, then why are they being promoted in Christian organization, colleges and churches throughout the world? Who's Promoting the Spiritual Disciplines and Contemplative Prayer? "In recent years there has been an attempt to recover the disciplines because, in fact, they were lost, by and large. That is true in places you wouldn't expect it. I have found many Roman Catholics to whom the spiritual disciplines were almost unknown, lost. There's a wonderful priest in Pittsburgh who has a telephone program." " He's called me occasionally when my books have come out, and one time we were on the air discussing The Spirit of the Disciplines, when someone called in and asked angrily, "Why don't you people teach these things any more? When I was young, Sister So-and-So taught us to fast, and taught us to contemplate and be silent, and now it's not taught any more."